Eager For Uighur: Will the Food of China’s Persecuted Muslim Minority Get Its Chipotle Moment? Kudret Yakup, born in the desert town of Kashgar in China, is on a mission to make kebab conquer the world. The 36-year-old restaurateur is the founder of Kebab Empire, a 24-hour Uyghur cuisine eatery in Hell’s Kitchen. “The food is all traditional from back home. We eat lots of meat — Uighur people are a nomadic people and traditionally, meat means lamb,” says Yakup. 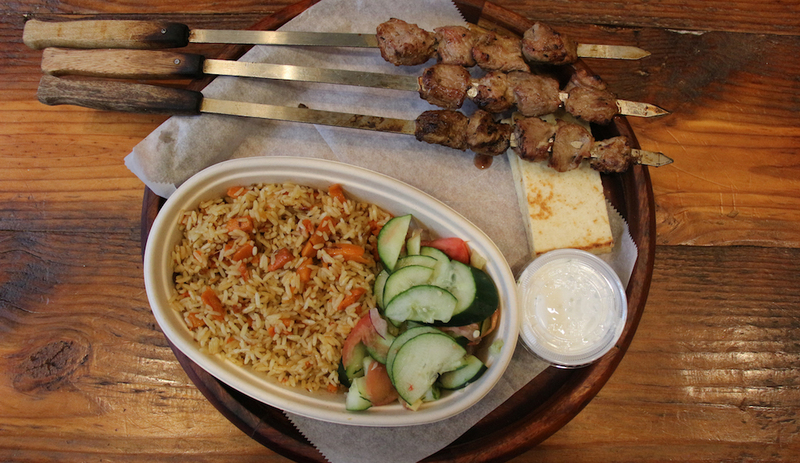 At Kebab Empire, there are the signature lamb kebab skewers, but also beef, chicken, salmon and eggplant ones to increase options for the uninitiated. Customers can choose combinations of these meats, along with salad, noodles or rice, while availing themselves of free tea, yogurt and bread. One of more than 50 ethnic minorities in China, the Uighurs hail from the restive Xinjiang province in China’s northwest or its neighboring Central Asian countries. Meat, which is always halal and usually lamb, is abundantly used, as are rice and hand-pulled wheat noodles called laghmen. There are soups, the deep-fried snack called samsa, dumplings called manti and the tandoor-baked bread, naan, to name a few. Cumin is one of the most common spices, variously used to flavor kebabs and polow — the celebrated rice dish cooked in a seasoned broth with meat and vegetables such as onions and carrots. Red and green peppers, coriander and onion-flavored greens also make frequent appearances. While Uighur food is similar to Uzbek food, it is unique as it also takes cues from East Asia. There is, for instance, the phonetic resemblance between hand-pulled Uighur laghmen noodles and lamian, the hand-pulled noodles common in northern China, which suggests a transferred influence between the two. “What we got from the Chinese was the vegetables and the frying. They eat pork, which we don’t eat. But we took the vegetables and that became a part of Uighur food. Uighur dishes are a combination of meat and vegetables. This is the fusion food. But not all Uighurs would agree to that,” says a recent Uighur immigrant from Urumqi, China to Fairfax, Virginia, who requested anonymity out of fear of interrogation his family in Xinjiang. While Xinjiang is unequivocally a Chinese territory, the Uighurs, who are a Turkic Muslim people of Central Asian origin with their own language (also called Uighur), have long chafed under the Chinese communist government that penalizes them for practicing their religion and maintains close surveillance in the region. In spite of limited access of the region to foreign media, there have been a number of news reports of human rights violations against Uighurs since 2017 with details about Uighur men being forced into mass “re-education” camps where they are reportedly subjected to physical and psychological abuse. Besides such violations of right to religion, expression and privacy, Uighurs have found their freedom of movement outside the country curtailed. Many Uighurs in the US now fear for family members in Xinjiang, and, hence, don’t talk about these issues openly. The Uighur community in the U.S. is small. According to the Uighur American Association, the largest number of Uighurs (estimated to be 5,000 – 6,000) in the U.S. live near Washington and neighboring Fairfax, Virginia, has emerged as prominent settling location for Uighur asylum seekers since the early 2000s. A few hundred are estimated to be living in Los Angeles, San Francisco and Houston. In New York, the number is still no more than a hundred. New York has long had a few options for Uighur food, even though most of these remained concentrated its Russian-language dominated neighborhoods of Brighton Beach and Sheepshead Bay in Brooklyn. These were generally run by Uzbek or Uighur immigrants from former-USSR countries. But there is a new boom of eateries in progress now around the U.S.
Over the past three years, four Uighur restaurants have opened in the Washington D.C. area. Los Angeles, San Francisco and Houston, Texas, have at least two each. And Boston has one too. 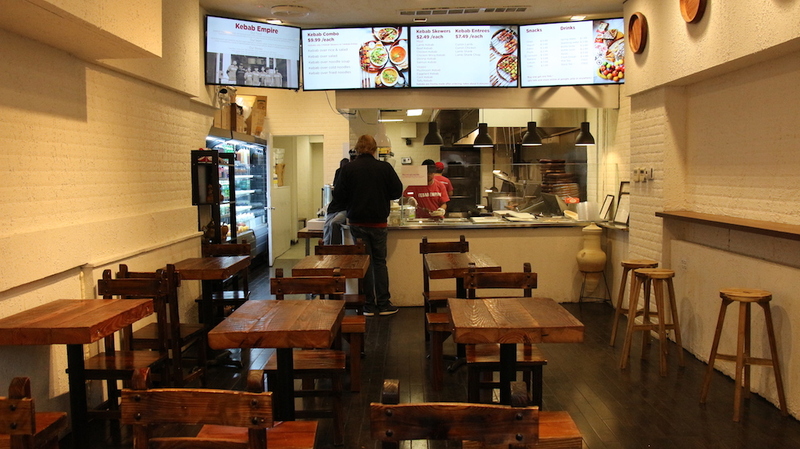 Yakup built his business in New York by starting with food carts in December 2016 and then opening a food court outlet in a mall in the New York borough of Queens. 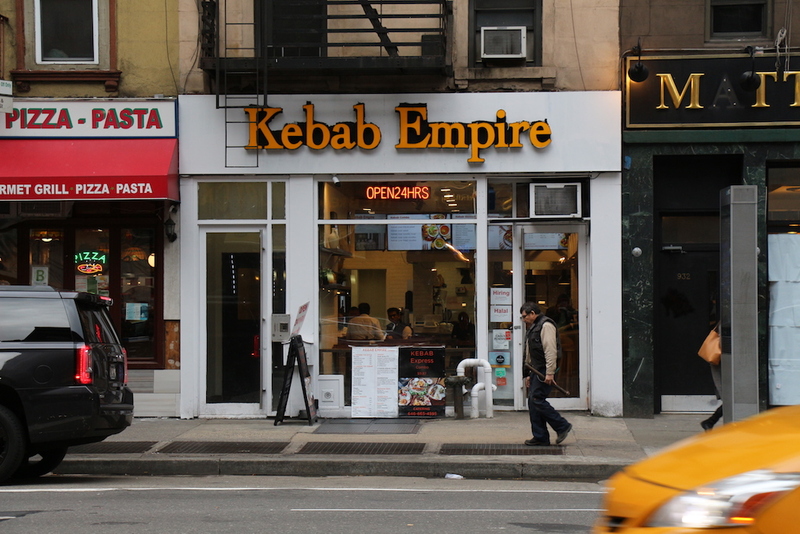 Finally, he opened Kebab Empire in December 2017. While many contemporary Uighur restaurants bring in Uighur chefs and are family-owned businesses, Yakup is on a somewhat different track. After graduating from Harvard University in 2010, he worked briefly for a California-based startup, and then as a financial investor in Xinjiang before he relocated to New York in 2016 with his family to apply his product-development skills in the food business. “I have entered the food business to be in it for the next 20-30 years,” he says. He has been working to standardize his brand’s recipes and plans to advance the empire of kebab along the lines of the Chipotle chain, starting with New York City, and aiming to go global. “There is a history of very strong food entrepreneurship in Xinjiang,” says Roberts, a cultural anthropologist specializing in Uighur culture and professor at George Washington University. Politics aside, he explains, Uighur food has been highly popular among the Han Chinese and many Uighurs have successfully run street food outlets and busy restaurants all over China since the late 1980s. “Uighurs are very business-oriented people. They can adjust to different foreign societies and start businesses,” says Omer Kanat, vice president of the Uighur American Association. The food businesses have long allowed many Uighurs – both in mainland China as well as in the U.S. — to earn a better livelihood without necessitating language fluency, which most lack at first. “The target customers are the Americans. And also the Han Chinese — who also like Uighur food,” says Kanat. Very well written article. Uighur culture and identity is demolishing and people are dying in East turkistan. By food culture it explains our current dilemma.